Stan Lee: A Life Well-Lived -- Excelsior! At Fort Monmouth, Lee learned how to string communications lines and also repair them, which he thought would lead to active combat duty overseas. Army strategists realized that wars were often determined by infrastructure, so the Signal Corps played an important role in modern warfare keeping communications flowing. Even drawing in numerous talented, intelligent candidates, the Signal Corps could barely keep up with war demands, which led to additional training centers opening at Camp Crowder, Missouri, and on the West Coast at Camp Kohler, near Sacramento, California. On base, Lee also performed the everyday tasks that all soldiers carried out, like patrolling the perimeter and watching for enemy ships or planes mounting a surprise attack during the cold New Jersey winter. Lee claimed that the frigid wind whipping off the Atlantic nearly froze him to the core. The oceanfront duty ended, however, when Lee’s superior officers realized that he worked as a writer and comic book editor. They assigned him to the Training Film Division, coincidentally based in Astoria, Queens. He joined eight other artists, filmmakers, and writers to create a range of public relations pieces, propaganda tools, and information-sharing documents. His ability to write scripts earned him the transfer. Like countless military men, Lee played a supporting role. By mid-1943, the Corps’ consisted of 27,000 officers and 287,000 enlisted men, backed by another 50,000 civilians who worked alongside them. The converted space that the Army purchased at 35th Avenue and 35th Street in Astoria housed the Signal Corps Photographic Center, the home of the official photographers and filmmakers to support the war effort. Col. Melvin E. Gillette commanded the unit, also his role at Fort Monmouth Film Production Laboratory before the Army bought the Queens facility in February 1942, some nine months before Lee enlisted. Under Gillette’s watchful eye, the old movie studio, originally built in 1919, underwent extensive renovation and updating, essentially having equipment that was the equivalent of any major film production company in Hollywood. Col. Melvin E. Gillette, the "architect of Military Pictorial Service"
Gillette and Army officials realized that the military needed unprecedented numbers of training films and aids to prepare recruits from all over the country and with varying education levels. There would also be highly-sensitive and classified material that required full Army control over the film process, from scripting through filming and then later in storage. 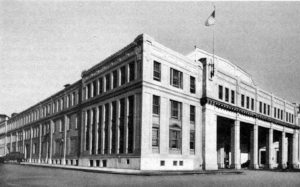 The facility opened in May 1942 and quickly became an operational headquarters for the entire film and photography effort supporting the war. The Photographic Center at Astoria, Long Island, was a large, imposing building from the outside. A line of grand columns protected its front entrance, flanked by rows of tall, narrow windows. Inside the Army built the largest soundstage on the East Coast, enabling the filmmakers to recreate or model just about any type of military setting. The stories that must have floated around that room during downtime or breaks! [i] During the time Lee was stationed at Fort Monmouth, Julius Rosenberg carried out a clandestine mission spying for Russia. He also recruited scientists and engineers from the base into the spy ring he led in New Jersey and funneled thousands of pages of top-secret documents to his Russian handlers. In 1953, Rosenberg and his wife Ethel were arrested, convicted, and executed. [ii] Stan Lee, interview by Steven Mackenzie, “Stan Lee Interview: ‘The World Always Needs Heroes,’” The Big Issue, January 18, 2016, http://www.bigissue.com/features/interviews/6153/stan-lee-interview-the-world-always-needs-heroes. [iii] Thompson, George Raynor, Dixie R. Harris, et al. The Signal Corps: The Test (December 1941 to July 1943). (Washington, DC: Office of the Chief of Military History, Department of the Army, 1957), 419. Joe Simon needed copy and he needed it fast! The Timely Comics editorial director and his coworker and friend Jack Kirby were hard at work on the hit they had recently launched – the red, white, and blue hero Captain America. Readers loved the character and Simon and Kirby scrambled to meet the demand. The Captain America duo brought in some freelancers to keep up. Then they threw some odd copy-filler stories to their young apprentice/office boy Stanley Lieber as a kind of test run to see if the kid had any talent. He had been asking to write and the short story would be his on-the-job audition. 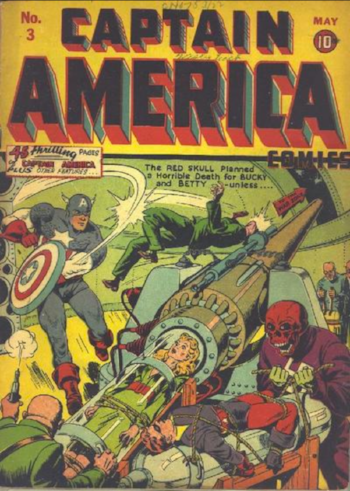 The throwaway story that Simon and Kirby had the teenager write for Captain America Comics #3 (May 1941) was titled: “Captain America Foils the Traitor’s Revenge.” The story also launched Lieber’s new identity as “Stan Lee,” the pseudonym he adopted in hopes of saving his real name for the future novel he might write. Given the publication schedule, the latest the teen could have written the story is around February 1941, but he probably wrote it earlier. The date is important, because it speaks to Lieber’s career development. If he joined the company in late 1939, just after Kirby and Simon and when they were hard at work in developing Captain America, then there probably wasn’t much writing for him to do. However, if the more likely time frame of late 1940 is accepted, then Lieber was put to work as a writer fairly quickly, probably because of the chaos Simon and Kirby faced in prepping issues of Captain America and their other early creations, as well as editing and overseeing the Human Torch and Sub-Mariner efforts. Lee later acknowledged in his autobiography that the two-page story was just a fill-in so that the comic book could “qualify for the post office’s cheap magazine rate.” He also admitted, “Nobody ever took the time to read them, but I didn’t care. I had become a published author. I was a pro!” Simon appreciated the teen’s enthusiasm and his diligence in attacking the assignment. An action shot of Captain America knocking a man silly accompanied Lieber’s first publication for Simon and Kirby. The story – essentially two pages of solid text – arrived sandwiched between a Captain America tale about a demonic killer on the loose in Hollywood and another featuring a giant Nazi strongman and another murderer who kills people when dressed up in a butterfly costume. “It gave me a feeling of grandeur,” Lee recalled at the 1975 San Diego Comic-Con. While many readers may have overlooked the text at the time, its cadence and style is a rough version of the mix of bravado, high-spirited language, and witty wordplay that marked the young man’s writing later in his career. In hand-to-hand combat with the evildoer, Captain America lands a crippling blow, just as the reader thinks the hero may be doomed. “No human being could have stood that blow,” the teen wrote. “Haines instantly relaxed his grip and sank to the floor – unconscious!” (Captain America Comics #3, p. 37) The next day when the colonel asked Steve Rogers if he heard anything the night before, Rogers claims that he slept through the hullabaloo. Stevens, Rogers, and sidekick Bucky shared in a hearty laugh. The “Traitor” story certainly doesn’t exude Lee’s later confidence and knowing wink at the reader, but it clearly demonstrates his blossoming understanding of audience, style, and pace. Both “Stan Lee” and a career were launched! Stan Lee Sues Marvel…And Wins! In a tale filled with greed, envy, unfulfilled promises, and years of legal scheming, Marvel announced a financial settlement on April 28, 2005, with its most famous employee – comic book legend Stan Lee. Filed under the heading, “Things No One Ever Expected,” Lee had sued Marvel three years earlier for not fulfilling the terms of his employment contract. The subsequent legal maneuvering created a tense situation for Lee and a public relations headache for the company he had helped build. The beguiling battle began in late October 2002, when the popular CBS news program 60 Minutes II aired a segment about the state of comic books and the tremendous popularity of superhero films. The report also examined Lee’s potential skirmish with Marvel regarding language in his contract, specifically certain payments Lee justly deserved based on the surging box office returns of Marvel films after decades of mediocre efforts and failed attempts at bringing the company’s superheroes to the screen. The new program painted Marvel in an evil light – a greedy corporation making insane amounts of money off the backs of its writers and artists. Lee’s 1998 contract seemed straightforward, but when it was inked no one expected the future to include such wildly successful films – X-Men (2000) earned nearly $300 million worldwide, while Spider-Man (2002) became a global phenomenon, drawing some $821 million. 60 Minutes II correspondent Bob Simon, using a bit of spicy language that seemed uncharacteristic for the venerable CBS show, actually asked Lee if he felt “screwed” by Marvel. Lee toned down his usual bombast though and displayed remorse for having to sue his employer, a situation that he explained “I try not to think of it.” As a result, many Marvel fans sided with Lee in the dispute. In early 2005, after the judge presiding over the case ruled in Lee’s favor, he again appeared on 60 Minutes. “It was very emotional,” said Lee. “I guess what happened was I was really hurt. We had always had this great relationship, the company and me. I felt I was a part of it.” Despite the high profile nature of the lawsuit and its apparent newsworthiness, Marvel attempted to bury the settlement agreement with Lee in a quarterly earnings press release. In April 2005, Marvel announced that it had settled with Lee, suggesting that the payoff cost the company $10 million. Of course, the idea that Lee had to sue the company that he spent his life working for and crisscrossing the globe promoting gave journalists the attention-grabbing headline they needed. And, while the settlement amount seemed grandiose, it was a pittance from the first Spider-Man film alone, which netted Marvel some $150 million in merchandising and licensing fees. Despite the financial loss, the lawsuit resulted in an unexpected upside for Marvel. The settlement put in motion plans for the company to produce its own movies, a major shift in policy. Since the early 1960s, Marvel and its predecessor companies had licensed its superheroes to other production companies. Back then, the strategy allowed Marvel to outsource the risk involved with making television shows and films, but also severely hindered it from profiting from the creations. This move gave Marvel control, not only of the films themselves, but the future cable television and video products that would generate revenues. Merrill Lynch & Co extended a $525 million credit line for Marvel to launch the venture (using limited rights to 10 Marvel characters as collateral), and Paramount Pictures signed an eight-year deal to distribute up to 10 films, including fronting marketing and advertising costs. Interestingly, the details of the settlement between Lee and his lifelong employer shed light on suspect Hollywood accounting practices that film companies use to artificially reduce profitability. For example, for all the successes Marvel films had in the early 2000s, raking in some $2 billion in revenues between 2000-2005, Marvel’s cut for licensing equaled about $50 million. Despite his earlier contract with the company, Lee had received no royalties. Although Lee received the settlement money and fences were eventually mended at Marvel, the episode is one of the stranger ones in Lee’s long career. In the long run, it transformed Marvel’s film strategy and helped it become a movie powerhouse. Stan Lee’s birthday on December 28 gave fans a reason to contemplate his place among the world’s most significant creative icons. It is easy to argue that the ideas Lee and his co-creators brought to life in Marvel superhero comic books are at the heart of contemporary storytelling. Lee created a narrative foundation that has fueled pop culture for nearly six decades. While countless shelves have been filled with books about comic book history and those responsible for originating this uniquely American form of mass communication, there are still many reasons to examine Lee’s specific role. Lee created a narrative foundation that has fueled pop culture for nearly six decades. History and context are important in helping people comprehend their worlds. New comic book readers and ardent filmgoers who turn out in droves to see Marvel Universe films should grasp how these influences impact their worldviews. In the 1960s and 1970s, no matter the tiny hamlet, thriving city, or rural enclave, if a kid got their hands on a Marvel comic book, they knew that they had a friend in New York City named Stan Lee. Each month, like magic, Lee and the Mighty Marvel Bullpen put these colorful gifts into our hands (in my youth in the 1970s, showcasing the ever-present “Stan Lee Presents” banner), which enabled us to travel the galaxies along with Thor, Iron Man, the Avengers, and X-Men. Crisscrossing the nation speaking at college campuses, sitting for interviews, and speaking to readers in the “Stan’s Soapbox” pages in the back of comic books, Lee paved the way for intense fandom. His work gave readers a way to engage with Marvel and rejoice in the joyful act of being a fan. Geek/nerd culture began with “Smilin’ Stan” and his Merry Marauding Bullpen nodding and winking at fans each issue. Lee’s commitment to building a fan base took fandom beyond capitalistic sales figures and consumerism to creating communities. While many comic book experts and insiders worried about monthly sales figures and demographics, Lee understood that Marvel’s horde of superheroes could form the basis of a multimedia empire. Ironically, he talked about turning Marvel into the next Disney decades before Walt’s company gobbled up the superhero shop. Back then, Lee’s idea drew derision and people openly scoffed at such a notion. Lee saw the pieces of a multimedia empire and relentlessly pursued this vision, almost singlehandedly pushing Marvel as a film and television company. Lee championed superhero films and television shows in the mid-1960s and through the 1970s when Hollywood producers couldn’t fathom someone like Spider-man, Thor, or Iron Man appealing to a mass audience. It took Star Wars and Christopher Reeves’s Superman to show Tinseltown what movies could be. One of the most important aspects of creating comic books is that the process requires all-encompassing teamwork, from plot creation through distribution. While a great deal of work takes place alone, like an inker working page-by-page, much of the effort is coordinated and intricate. At Marvel, really from the time Lee took over as editor as a teenager in 1941 until the boom in the early 1960s, he managed the artistic and production aspects of the company, simultaneously serving as art director, chief editor, and head writer. Much of the scholarly and critical commentary has centered on the controversy regarding Lee’s role as creator or co-creator of the iconic superheroes, but without similar focus or discussion about how he managed these other aspects. Artists Jack Kirby and Steve Ditko were phenomenal talents, but in contrast to Lee, they focused on one part of the production process. Lee directed, managed, or supervised it all. Yet, when Marvel publisher Martin Goodman suggested he mimic DC and create a superhero team, Lee took a risk on a new kind of team, heroes who had their superpowers foisted on them and didn’t hide from their real human emotions. The Fantastic Four gave Lee the chance to explore a new type of hero and fans responded. Lee didn’t quit. The Marvel Universe was born. Lee’s legacy is undeniable: he transformed storytelling by introducing generations of readers to flawed heroes who also dealt with life’s everyday challenges, in addition to the treats that could destroy humankind. Generations of artists, writers, actors, and other creative types have been inspired, moved, or encouraged by the Marvel Universe he gave voice to and birthed. Lee did not invent the imperfect hero, one could argue that such heroes had been around since Homer’s time and even before, but Lee did deliver it – Johnny Appleseed style, a dime or so a pop – to a generation of readers hungry for something new. The Fantastic Four transformed the kinds of stories comic books could tell. Spider-Man, however, brought the idea home to a global audience. Lee told an interviewer that he had two incredibly instinctive objectives: introduce a superhero “terribly realistic” and one “with whom the reader could relate.” While the nerd-to-hero storyline seems like it must have sprung from the earth fully formed, Lee gave readers a new way of looking at what it meant to be a hero and spun the notion of who might be heroic in a way that spoke to the rapidly expanding number of comic book buyers. Spider-Man’s popularity revealed the attraction to the idea of a tainted hero, but at the same time, the character hit the newsstands at the perfect time, ranging from the growing Baby Boomer generation to the optimism of John F. Kennedy’s Camelot, this confluence of events resulting in a new age for comic books. Celebrate Stan Lee's 94th Birthday! December 28 marks Stan Lee's 94th birthday! On his birthday, I'll forward all comments to Stan in celebration of his career as one of America's most important creative icons!